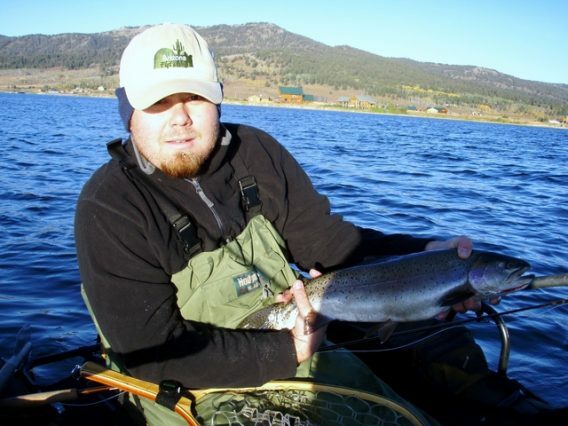 Jimmy K. Crain was born in Phoenix, AZ and has been fishing since the day he could hold a rod. In fact for his birthday, as a kid, he requested to spend a week in the White Mountains. Whether or not it was fishing in the White’s or fishing one of the many bass tournaments he fishes, Jimmy always loved to fish. But around 2005-2006 a true obsession began. His friend, Greg invited him to go fly fishing. On his first trip he was hooked. Three months later Jimmy received his first fly tying kit. After watching Jimmy tie flies with Gary Hitterman every Thursday night, Mike McLaughlin decided to ask Jimmy to tie flies for AZ Flyfishing. When he’s not working or fishing, he’s tying up flies or dreaming up new flies to catch more fish. Jimmy’s favorite place to fish now days is in the Rim country. If you run into him in that area, feel free to pick his brain.